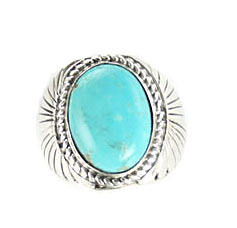 Navajo crafted sterling silver mens ring with a free form or a13x18mm stabilized Kingman turquoise stone. Top of ring measures approximately 7/8" wide and tapers down. Color shades of turquoise will vary. 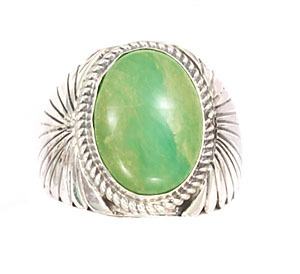 Mostly available in green teal shades. None available in colors as pictured.